Sri Lanka. Empty beaches and crowded cities. Terraced tea plantations and wild jungles. Elephants and leopards, whales and monkeys, friendly people and incredible food. Ignored by travellers during two decades of civil conflict, tourism is only now starting to reappear on this teardrop-shaped island off the bottom of India. While package tours are popular, they’re far from the only way to see the best of what the country has to offer. I spent three weeks travelling independently around the southern and central parts of the island by bus, train and tuk-tuk. The experience put Sri Lanka firmly near the top of my list of favourite destinations. If you’re considering budget travel in Sri Lanka, here’s what you need to know. Note: this post is long and detailed! I’ve broken it down into several sections, which you can skip to using the links below. First things first: Sri Lanka isn’t a super-cheap destination in the same way as India, Nepal or most of South East Asia. Accommodation and food are more expensive than neighbouring countries, and the entrance fee to major attractions for foreigners is disproportionately high. 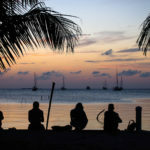 Expect a daily budget of $30-$50 per person on accommodation, food, drinks, and transport. That cost is based on staying in guesthouses and homestays, and eating at local restaurants or your accommodation. Hostels aren’t all that common outside the cities, but when you can find them, you’ll save a few dollars if you’re travelling alone. If you decide to take in most of the main sights, you could easily spend the same amount again on entrance fees and tours. In the end, the high cost of attractions put me off visiting many of them. Travelling alone for much of my time in Sri Lanka, and unable to split costs, anything that required hiring a driver or guide was out of reach. Luckily, many of the best parts of the country — food, beaches, and people in particular, cost little or nothing to experience. Sri Lankan keeps the visa process simple. The Sri Lanka Electronic Travel Authorisation site isn’t the most attractive in the world, but it works well. Unless you come from one of a small number of nearby countries, you’ll pay $30 USD for a 30-day double-entry visa. The site accepts credit cards, and you’ll receive a confirmation email within 24 hours with the details you need. If you want to be particularly organised, feel free to print it out. I didn’t, and although I’d saved the email on my phone, nobody asked to see it. Two-day transit visas are free if you’re just passing through, and longer visas are available if you need them. It’s also possible to extend a tourist visa within the country, if you happen to fall madly in love with Sri Lanka and can’t bear the thought of leaving. 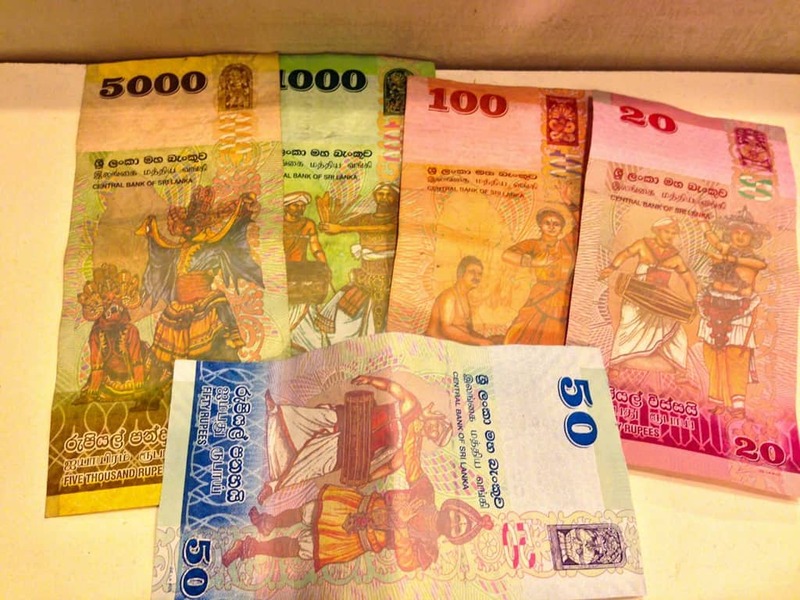 The currency in Sri Lanka is the rupee (LKR), which at the time I travelled was worth around 130 to the US dollar. ATMs are common throughout the country, although on one occasion I did need to take a tuk-tuk to the next town a few miles down the road to find one. All of the ATMs I tried accepted international cards, with only a small fee (around 50c), but withdrawal limits vary significantly by bank. If the machine you’re using won’t give you enough money in a single transaction, just find another that does. As far as budget travellers are concerned, Sri Lanka is primarily a cash economy. Don’t expect to find credit card facilities in guesthouses or local restaurants. Small bills are always appreciated, and many vendors won’t be able to make change if you hand them a 5000 rupee note. Like most visitors, I arrived in Sri Lanka via Bandaranaike International Airport around 35km from Colombo. Immigration and luggage reclaim were painless, and the terminal was clean and reasonably modern. Getting local currency was straightforward, with the staff of several foreign exchange booths vying for attention as soon as I left the baggage area. They offered a competitive rate, but there were several ATMs nearby if you’d prefer to withdraw money instead. I picked up a local SIM card before leaving the terminal, then headed out to brave the morning heat and taxi drivers. Due to the captive market and distance from Colombo, private transport options from the airport are expensive for budget travellers unless they’re in a group. You’re looking at around 2500 LKR (~$19) for a taxi into Colombo, and 1500 LKR ($12) for a seat in a shared minivan. Local buses into the city cost 150 LKR (~$1.20) – there isn’t an airport stop, but should be a free shuttle to the bus station. Luggage space will be at a premium, so don’t expect to get on with large suitcases. You’ll be able to ask an airport official where to catch the shuttle from (and if it’s running). Since I was taking the train down to Galle the same day, I needed to get to Colombo Fort station. While there is a train service that runs there directly from the airport, it only operates twice a day. The schedule is much more regular from Katunayaka South station, less than ten minutes from the airport in a tuk-tuk. I couldn’t find a driver who would charge less than 250 LKR (~$2) per person for the journey, but if you’re in less of a hurry and a better negotiator than me, you should be able to pay less. From there, the third class train into Colombo cost around 25 LKR (20c), and took about 75 minutes to get to Fort station. It ran at least once an hour, and serves as the perfect introduction to Sri Lanka. You’ll likely be the only foreigner on the train as it winds through the countryside and Colombo suburbs. Sri Lanka has two official languages, Sinhala and Tamil, and you’ll see their gloriously looping forms on signs everywhere. English is also quite widely spoken and usually found anywhere visitors are expected to be. Bus destination boards, road signs, many shops, and even advertising billboards often include an English translation. Communicating with locals was rarely an issue. Before arriving in Sri Lanka, I’d been concerned about the cost of accommodation based on what I found online. As it turned out, my concern was only somewhat justified – mostly because in August, it was rarely hot enough for lack of air conditioning to be a problem. Opting for rooms without a/c bought the price down. I found anywhere near the ocean had a fan and enough breeze to keep things cool. On average, I paid $20-30/night for a clean private room with hot water and (usually) breakfast. If I’d had my own transport, I could have reduced this a bit -– there were some good options outside the centre of many towns. Since I didn’t want to have to take a tuk-tuk or walk 30+ minutes in the midday sun every time I went anywhere, however, I generally stayed close to the action. I often booked a room the day before arriving somewhere new, just so I could ignore the crowd of “helpers” that meet every bus. It’s definitely possible to just turn up and find somewhere to stay, though, and doing so usually yielded a good result. Just be prepared to spend some time tracking down a place that works for you, and don’t be afraid to negotiate. Stay in at least one or two homestays during your time in Sri Lanka. They tend to be smaller than guesthouses, often with only a couple of rooms for guests , and entirely family-run. Breakfasts will almost always be included, and you’ll often be able to have dinner with the family for a few dollars as well. Take up the offer if it’s extended – the food will be even better than in local restaurants. You can compare prices across all the main booking sites on HotelsCombined, which saves a bunch of time on slow Internet connections. You’ll find plenty of those in Sri Lanka. Ahh, the food. I’ll freely admit I didn’t know much about Sri Lankan cuisine before arriving, naively assuming it’d be similar to that in India. 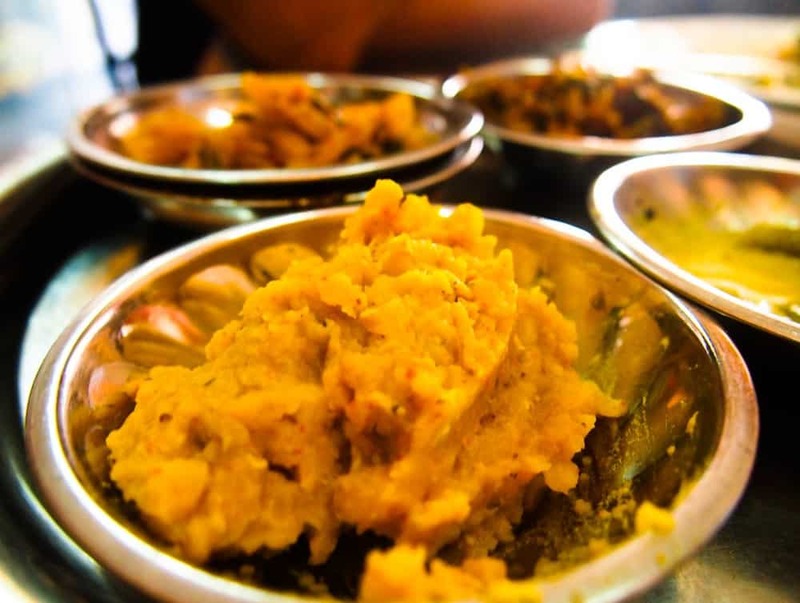 While the basic components of many dishes were familiar — rice, curries, papadums, and roti — that’s about where the similarities end. I don’t think I’ve ever eaten as well (or as much) as I did during my time in Sri Lanka. Other travellers have spoken of getting sick of the ubiquitous “rice and curry”, but god knows I never did. The simple name hides the fact that despite eating this dish at least 30 times during my trip, I was never served the same meal twice. The meal consisted of a large plate of rice, plus anywhere between four and a dozen different curries in little bowls. There’d usually be a meat option – salted fish or chicken being most common – along with some fluffy dahl, but after that it was hard to predict. I had fruit and vegetable curries of almost every flavour – potato, pumpkin, beans, jackfruit, beetroot, eggplant, and many others I couldn’t identify. The only similarity was that they were all damn delicious. Every. Single. One. Breakfasts varied, too, but my favourite was string hoppers. Resembling noodles and made from rice flour, the actual hoppers were pretty bland — but adding a healthy spoonful of the coconut or onion sambal that came with it made a life-changing culinary explosion go off in my mouth. I wasn’t as excited by egg hoppers (a thin fried pancake with an egg in the middle) or the sweet, sticky roti pancakes. What I did learn, though, is that there are at least a million different ways to use a coconut at breakfast time. I won’t go into detail about everything I ate in Sri Lanka, but there’s no way I couldn’t mention kottu roti. You’ll likely hear the distinctive metallic chopping sound of its preparation long before you order it, serving as a beacon for hungry passers-by. It’s simply shredded pieces of roti bread mixed with spices and vegetables, seafood, or meat. Chopped up, stir-fried, and served with a hot, spicy sauce, it’s the perfect street food, and goes down extremely well with a cold bottle of Lion beer. Say, for example. It’s the spices, though, that will always remind me of Sri Lanka. Cumin was ever-present, but my uneducated nose and taste buds struggled to identify the complex mixtures after that. Coriander, turmeric, cinnamon, and undoubtedly many more. Chilli, both ground and chopped, always made an appearance. I like spicy food, and only rarely found a meal too hot to handle, but if you’re not a fan of chillies you’ll want to mention that when you order. Food prices varied widely depending on where I chose to eat. It wasn’t unusual to see prices as high as 1200 LKR (~$10) for rice and curry in the most tourist-friendly parts of town, but following the locals yielded better food for a dollar or two. As always, look for the crowded restaurants and street stalls, and don’t worry about the state of the furniture. It’s the popularity and fast turnover that keeps you happy and healthy, not the presence of a tablecloth. Many well-heeled visitors to Sri Lanka hire a car and driver for their stay, but if you’re a budget traveller and not in too much of a hurry, there’s really no need. The rail system dates back to colonial times and is extremely slow. It’s also cheap, reliable, and travels through some spectacular countryside. There are first class air-conditioned carriages on a few routes, but they quickly fill up with tour groups. If you’d prefer to save money and spend your journey chatting to locals instead, buy a second class ticket. The breeze blowing in through the open windows and doors cools all but the most crowded trains. Many shorter routes only have a third class option, which is basic but fine. You’ll also be able to take much better photos from the cheaper carriages, especially if you’re happy to hang out the door to do so. 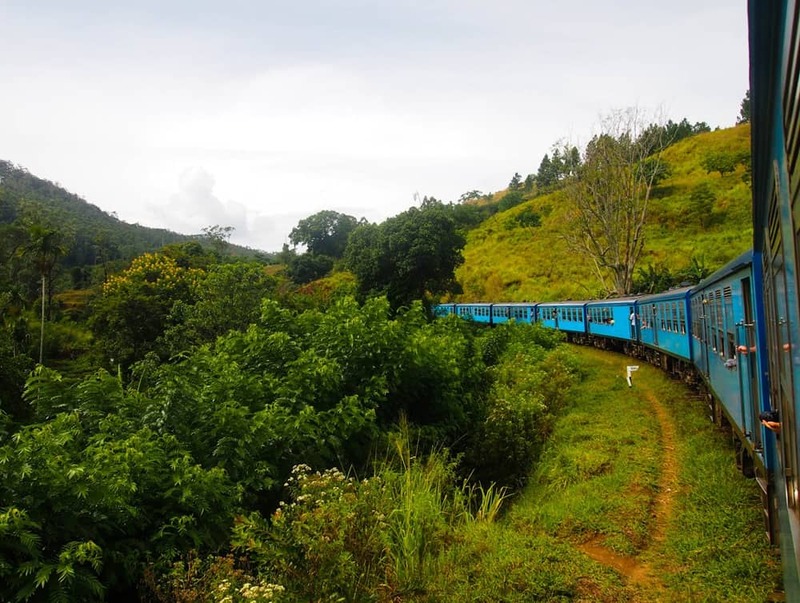 Some trains on the popular Colombo to Badulla route include a fancy, privately-operated carriage that can be booked online, but tickets for the government-run carriages need to be purchased at a station. Advance tickets go on sale ten days before departure, but you may not be able to buy them from the smaller stations. I was advised to go to Matara or Galle when trying to book a ticket in Weligama, for example. 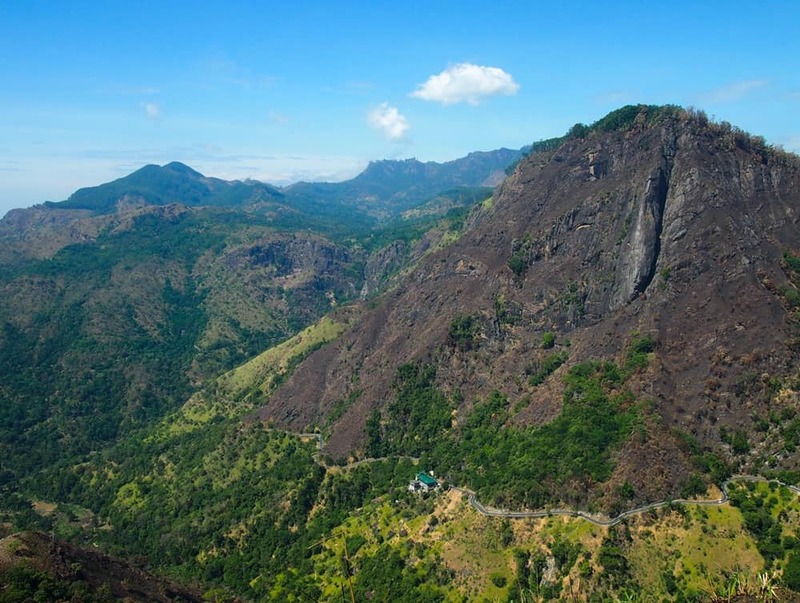 The trip from Ella to Kandy is widely regarded as one of the most scenic rail trips in the world, and has the popularity to match. Every ticket for the famous observation car was sold out for the next ten days, so I booked the last second-class seat for a train leaving three days later. Long story short: if you’re planning to take that train journey (and you should, because it’s amazing), book your outbound ticket from Ella as early as possible. Unfortunately, the train lines don’t run everywhere in the country, so at some point you’ll end up on a bus. These are far more plentiful, and will get you close to anywhere you want to go. They’re as cheap as the train, often more crowded, and will always involve plenty of time on the wrong side of the road. Most buses will have limited space for your luggage, either beside the driver or sometimes in the back. Sri Lankans seem to travel light around their own country, so as long as there aren’t many other foreigners on your bus, you’ll find somewhere to stow a backpack or small suitcase. Failing that, you may be able to buy an extra ticket and put your bag on the seat beside you, or resign yourself to having it in your lap for a few hours. Timetables do exist, but as buses leave when full they’re more of a guideline than a rule. The easiest option is to ask your guesthouse owner how often buses run to your next destination, then turn up at the station with time to spare and ask around. Random strangers are usually incredibly happy to help out the lost-looking foreigner. They’ll often do everything from showing you where to stand to keeping an eye out for the bus for you, waving it down, explaining to the driver where you’re trying to go, and helping you with your luggage. Even if you’ve been told you’ll need to change somewhere, it’s always worth asking if there is a direct bus to your destination. Sometimes they only run once or twice a day, if they exist at all, but you never know. It’s worth keeping a collection of small notes and coins handy to pay for your ticket. Expect to pay as little as 30 LKR for a short journey between neighbouring towns, and 200-300 LKR for a trip that takes several hours. If you don’t want to hire a car and driver, but dealing with long days on public transport doesn’t sound appealing, there are a few other options. I met a French couple who had hired a small car and driven around much of the country with it. They said it was nerve-wracking most of the time, but the freedom and flexibility made it worth the occasional scream. I also ran into a British couple who had just finished a multi-week motorbike trip. They’d rented a 250cc bike that was appropriate for getting well off the main roads, but scooters are also available if that’s more your style. And, of course, there are auto rickshaws (tuk-tuks). These take the place of taxis in much of the country, and you’ll see them everywhere. While many of the tuk-tuks look much the same, every driver is different. They’re not all out to scam you, but many do love to overcharge foreigners. I was told by a guesthouse owner in Mirissa that the going rate for tourists was double the local price. You can always bargain, and will usually get a cheaper price when you do. Be very clear about where you’re going however, and what the final price will be. You may even want to write the address and price on a piece of paper to show your driver for their agreement. And to use as evidence if you still end up having an argument at the end of the trip. 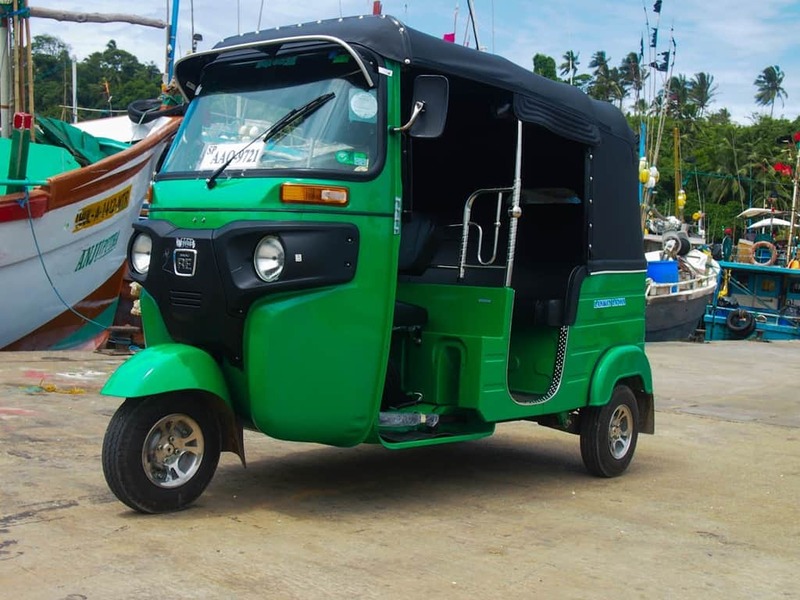 Finally, if you love the sound of a tuk-tuk but not the idea of haggling with drivers all the time, you can rent one to drive around the country yourself. Some fellow travel bloggers did exactly this, and put the idea in my head for my next trip to Sri Lanka. Because, seriously, how amazing does it sound? I found Sri Lankans to be some of the warmest, friendliest, and most helpful people I’ve ever met. Strangers on a train or bus would strike up a conversation within a minute. If I was travelling alone, restaurant staff would want to know if I had a girlfriend. If Lauren was with me, they’d ask when we were getting married. I barely had a chance to look lost before someone would approach to see if I needed help. If they didn’t speak English, they’d call a friend who did and get them to translate. Kids, families, old men and women would break into smiles when I wandered past, and it was almost impossible to walk more than a block without someone calling out a greeting. In some parts of the world this kind of interaction with locals seems a little forced, but in Sri Lanka it rarely did. There seemed to be a genuine interest in talking to visitors, finding out what they thought of the country, and what had bought them to Sri Lanka. The only real exceptions were tuk-tuk drivers, but that’s fairly common anywhere in the world. Even then, I had a couple of great experiences. There was the guy in Galle, for instance, who serenaded us with Bob Marley songs as we zipped through the streets in his bright pink rickshaw. A few days later, hearing I was interested in renting a tuk-tuk of my own, a driver in Mirrisa insisted we swap seats so I could get some practice ahead of time. I felt incredibly safe in Sri Lanka with Dave by my side but sadly didn’t feel the same when venturing out alone. While wandering around by myself, I noticed stares from 90% of the local men I passed, and the majority of them would try and strike up a conversation with me. This didn’t happen when I was with Dave, when I was mostly ignored. It was a huge difference and one that greatly unsettled me. I took a solo train journey, where I was sat by the window, and at each train station we passed, the local men on the platform would see me and gather by my window, staring. Not saying anything, not doing anything, just relentlessly staring. A huge crowd! It spooked me so much that I stopped using public transport alone and went with taxis instead for the rest of my time in the country. So, it’s tricky. I can’t say it’s unsafe for solo female travellers when nothing bad happened to me. Nobody even attempted anything untoward. But the stares? They left me uncomfortable and feeling vulnerable. Yes, cricket. That odd sport played by Britain and its former colonies. The only game that can last for five full days and still end up in a draw. If you’re from a cricket-playing country, you’ll have immediate common ground with any Sri Lankan male old enough to hold a bat. If you know the slightest thing about the sport, you’ve pretty much made a friend for life. 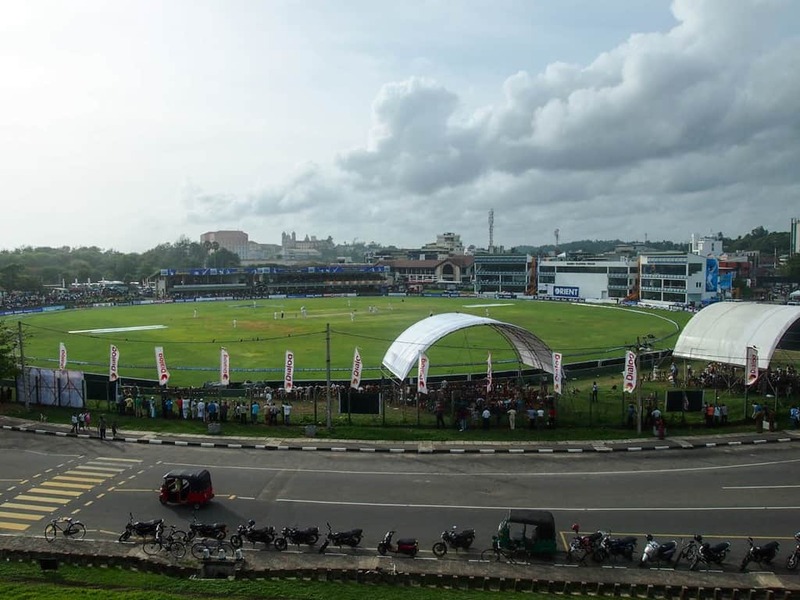 My time in Sri Lanka happened to coincide with a cricket tour by the Pakistani team, and I ended up being in Galle for the first four days of a match. In an inspired move by the authorities, ground entry was free. I could just turn up to lie on the grass and watch the game for a few hours each day, coming and going as I pleased. Vendors walked past with spiced peanuts, ice-cream, cold drinks, and a random selection of fried goods, and there was always a group nearby to share the twists and turns of the match with. Blissed out in the sunshine, listening to the sound of bat, ball, and an assortment of out-of-tune instruments, I was about as happy as I’ve ever been on my travels. Best of all, Sri Lanka won in the dying minutes of the final session. Perfect. Wi-Fi was available in all of the places I stayed, as well as many restaurants, bars, and cafes. Speeds varied much more than I expected, from an astonishing 17Mbps connection at a guesthouse on the beach near Tangalle, to some that were too slow to load a web page. Typical speeds were around 3Mbps download and half that for uploads, which was fast enough for anything I needed to do online. Note that Colombo Airport doesn’t officially provide free Wi-fi, but there is a coffee shop in the transit area that offers a glacially-slow connection if you buy their overpriced beverages. I wrote an entire post about the process of buying and using a SIM card in Sri Lanka. Briefly, though, prices were reasonable, coverage was good, and speeds were quite quick. Power, too, wasn’t a problem. Over the course of three weeks I experienced two blackouts, once for a couple of hours after a huge storm in Ella, and the other for a few minutes in Tangalle. 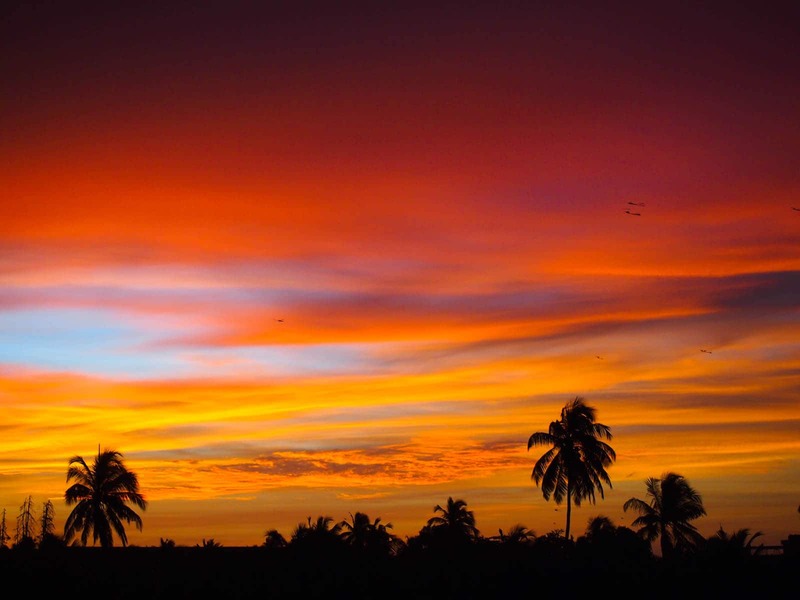 Despite its small size, Sri Lanka experiences very diverse weather. The island has two distinctive monsoon seasons, one in the southwest and one in the north and east. I visited the southern coast during the monsoon. Despite being prepared to change my plans if the weather was causing problems, however, there was no need. While there were some heavy downpours overnight and some afternoons, they didn’t stop me from doing anything I’d planned. Temperatures on the coast were hot and relatively humid, although sea breezes made a big difference. In the highlands, temperatures were somewhat lower during the day and much cooler overnight, with fog and rain not uncommon in the afternoon in Ella. Pack sunscreen, a hat, walking shoes, and a rain jacket, and you’ll be fine pretty much everywhere! 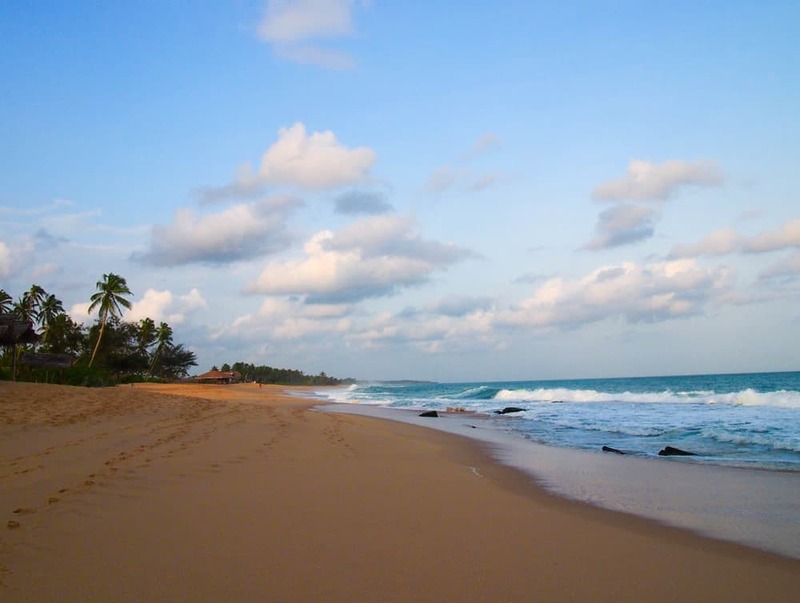 Sri Lanka is renowned for its glorious beaches, and I made a point to visit several along the southern coast. After only planning to spend one night in Galle, the gorgeous old colonial buildings and cricket match I mentioned forced me to return for another few days. Galle Fort, the UNESCO-listed part of town, was by far the most touristed place I visited in Sri Lanka, with food and accommodation prices to match. I spent most of my time in the city exploring the old town, wandering along the walls, and admiring the restored buildings. When I wasn’t sightseeing I was watching cricket from inside the ground or atop the ramparts. If there isn’t a game on (or you’re a bit strange and don’t love cricket…), you only need a couple of nights in town to see the best parts before leaving for somewhere a little more budget-friendly. I’d highly recommend eating outside the walls of the fort, both for the savings and the quality of the food. I found a little place between the train and bus stations offering fish, rice, and curries for 200 LKR ($1.50.) The food was plentiful, delicious, and definitely not toned down for foreigners. There wasn’t much English spoken, but pointing and smiling worked just fine. It was hard to find a decent private room for under 4000 LKR in Galle Fort, although there were also a few places offering dorm beds. I stayed in two different rooms at Inn64 in the heart of the old town. I preferred the room overlooking the road — it was a little smaller, but being able to sit out on the balcony was great. This was one of the few places I stayed that had air-conditioning, but it wasn’t really necessary. The wi-fi was fast, the owner was friendly and it was in a great location. All in all, I liked it a lot — although it was expensive by Sri Lankan standards, it was good value for Galle. We paid 4500 LKR ($35) as a walk-in rate. The train from Colombo Fort to Galle took a little over two hours, and a second-class ticket cost 180 LKR (~$1.40). It was pretty crowded, so I had to stand up for most of the journey, but the coastal views were enough of a distraction from my aching feet. 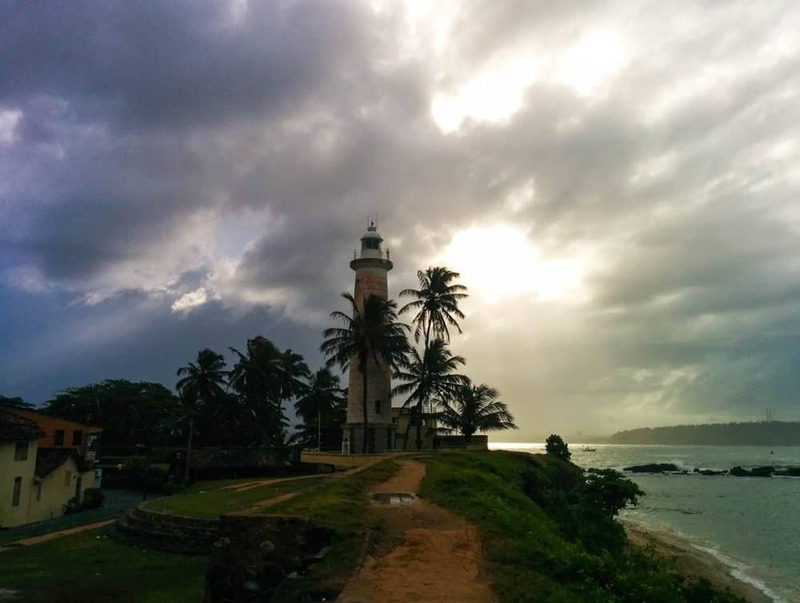 A little further along the south coast lies Mirissa, a laid-back little coastal town. We spent most of our days on the long, narrow strip of beach, watching the surf endlessly crash onto the sand. The waves were impressive during monsoon season, and more than a few minutes in the ocean left me feeling like I’d been put through a spin cycle. The big tourist draw in Mirissa is whale watching, but it wasn’t really the right time of year to see them when I was there. Prices seemed reasonable enough at around 6500 LKR ($50) for a half day excursion, but I amused myself by wandering round the harbour chatting to fishermen instead. There weren’t all that many dining options, but it wasn’t hard to find a couple of decent places. 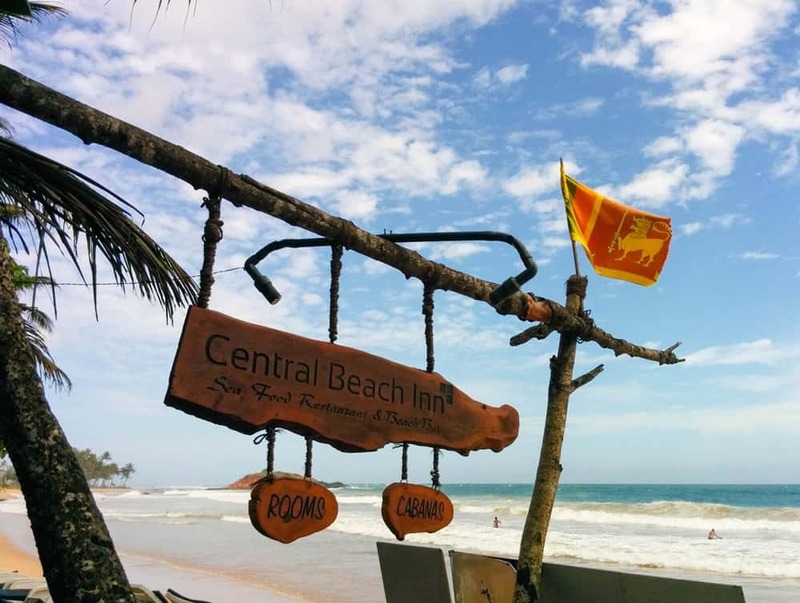 Most lunches consisted of a beer, rice, and curry on the sand at Central Beach Inn. Dinner was from Dewmini Roti Shop, a great little place a few minutes off the main road. We spent three nights at Bon Accord, a small, immaculately-kept guesthouse near the western end of the beach. The owner cleaned the entire place twice a day, and it could well be the most spotless accommodation I’ve ever had in Asia. The multi-course breakfasts were outstanding, and playing with the puppies while watching peacocks land on the neighbour’s roof each day was an added bonus. We paid 4500 LKR ($35) for a fan room with balcony – again, expensive for Sri Lanka but worth every penny. Highly recommended. I spent the remainder of my time in Sri Lanka travelling solo, starting with three nights just east of Tangalle. There wasn’t much to the town itself, but the beach was remarkable. There were miles of almost empty sand, broken up only by the occasional hotel or shack of a seafood restaurant. The surf was even heavier than in Mirissa, if that’s possible, so I observed it from the safety of my towel. There was little else to do without taking a tuk-tuk back into town, and that suited me just fine. I whiled away my days reading, snoozing in the hammock, and trying to digest the enormous meals coming out of the guesthouse kitchen. I stayed at Lonely Beach Resort, where I passed on the ocean view and picked up one of the cheaper fan rooms for 2800 LKR (~$21) per night. It may have overlooked a nearby swamp, but it was clean and spacious, had a large balcony and there was always enough breeze to deter the bugs and keep me cool. Wi-fi was patchy in the room, but very fast when sitting in the restaurant with a beer – so that’s exactly what I did when checking emails. I’m not sure if the beer was a requirement to get the faster speeds, but I wasn’t prepared to risk it. The food at the guesthouse seemed a little expensive, especially given breakfast wasn’t included in the room rate, but it was uniformly excellent. I also ate at the hotel restaurant next door a couple of times, which had a slightly better view and slightly worse food. The bus ride from Galle to Matara lasted a couple of hours, and after a short wait, the next bus to Tangalle took about the same time. Each ticket cost under a dollar – as usual, the ten minute tuk-tuk ride to my final destination cost more than the several hours of buses that preceded it. Two weeks after leaving the coast to head inland, I returned for my last few nights in Sri Lanka. Negombo is the closest stretch of coast to the airport, and felt like it. Prices were generally higher, restaurant food was generally worse, tourists were more plentiful, and touts were more persistent than elsewhere in the country. The beach, though, was impressive – long, wide and empty, at least at the northern end of town where I spent most of my time. Locals played football and cricket in the evening, with only complete darkness ending those simple pleasures. I did manage to find a great little rice and curry restaurant on the main road, half the price and twice as good as anything else I’d walked past on that long strip of souvenir shops and travel agents. It says something about the lack of decent alternatives that despite the restaurant being a half-hour walk from my guesthouse, I went back again for lunch the next day. I spent three nights at Suriya Arana Hotel, a family-run place with clean, large a/c rooms, and an included breakfast. It was totally worth eating dinner there as well – the meals weren’t all that cheap, but they were very good. A recent storm meant the Internet wasn’t working during my stay, but the couple that run the place were both lovely, and I’d happy stay there again. It was good value for Negombo, at 3000 LKR ($23) per night. My homestay owner in Sigiriya dropped me off at the bus stop in Dambulla, where a crowded bus negotiated endless roadworks to drop me in Kurunegala for 180 LKR ($1.50) a couple of hours later. An air-conditioned minivan then took me on to Negombo for around 300 rupees ($2.40), where I asked to be let out on the side of the road to walk the last mile to the hotel rather than backtracking from the bus station. Even though the highlands are under 100km from the coast, they feel like a different country. Towering mountains, green jungles, misty valleys, cooler temperatures, and tea plantations as far as the eye can see. 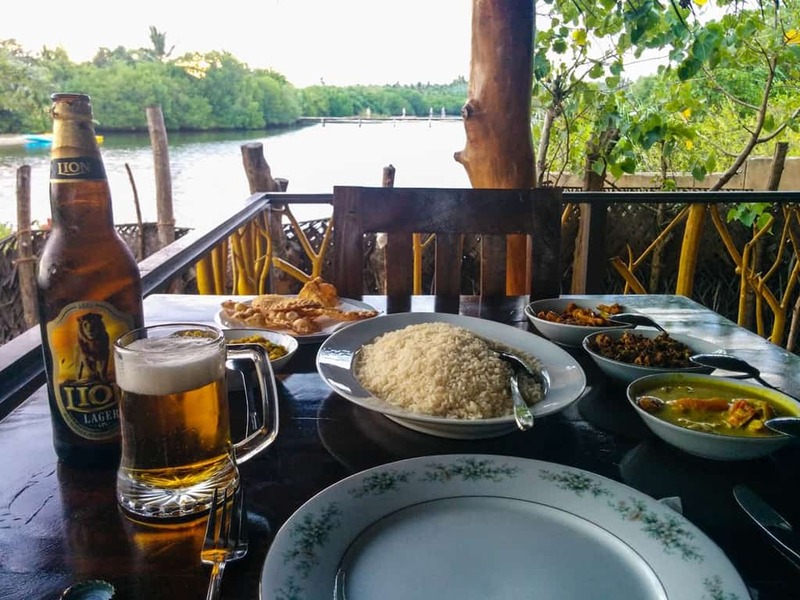 If you stick to the coast, you’re only getting part of the Sri Lankan experience. The small hill town of Ella wasn’t quite what I expected. There’s not much to it — several guesthouses, restaurants, and convenience stores spread along a chaotic main street full of wandering tourists, creaky buses, and barking street dogs. Fortunately, I found a homestay a few minutes away down a side street that was much more peaceful, giving me the chance to enjoy what everyone really goes there for: the stunning countryside. 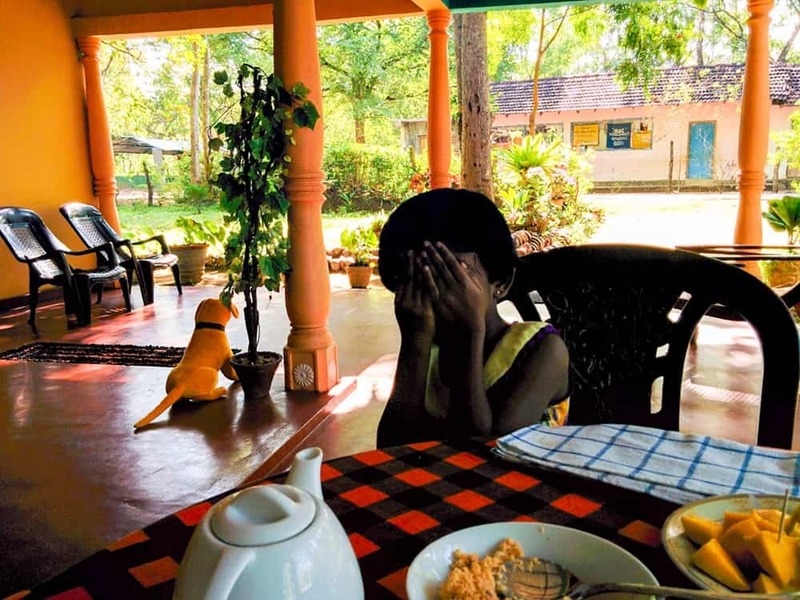 Although I’d only planned to stay a couple of days, I ended up extending to five -– I loved my homestay and the cool, fresh air, and was in no hurry to leave. Other than working my way through my Kindle when the rain rolled in every afternoon, I spent one morning hiking up Little Adam’s Peak, and another walking a few kilometres back down the road to a waterfall I’d passed on the way in. Both were well worth the effort, but I’d suggest starting early to avoid the heat. There were a few good food options in town, with delicious cheap fish kottu roti at the Ella Curd Shop, and higher-end options with a great view at AK Ristoro. After searching fruitlessly for half an hour on the main road, a tuk-tuk driver convinced me to let him drive me round several accommodation options on the hilly side streets. It ended up being a good decision, as I discovered Bloom Rose Inn. Run by a lovely, warm family, it was pretty much everything I could have hoped for in a homestay. I got a large clean room, fantastic food, plenty of helpful advice, and at 3000 LKR ($23)/night including breakfast, a reasonable price. There was no fan or a/c, but surprisingly, the room didn’t need them. It got positively chilly at night in Ella! I managed to catch a 10am direct bus from Tangalle to Ella, which took four hours and cost around 260 LKR ($2). It was crowded, but I was able to get a seat after the first hour or so. Despite being the cultural capital of Sri Lanka, I wasn’t overly excited by Kandy. It seemed busy and noisy, with surprisingly lousy food options. Walking around the lake was mildly interesting, but the main highlight for me was the Botanical Garden. 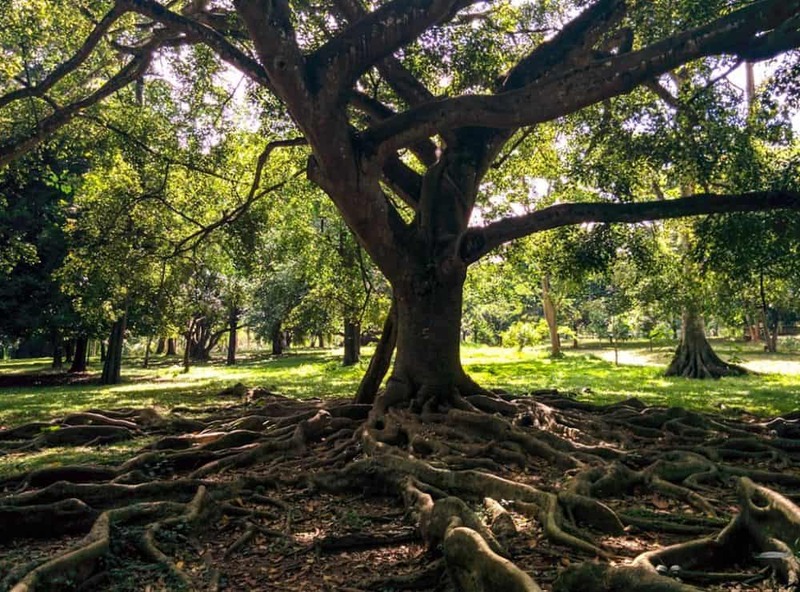 It was easy to get to by local bus, and I spent several hours wandering around admiring the diverse trees, plants, monkeys, snake charmer, and, in one memorable encounter, a scorpion. As with most other attractions in Sri Lanka it was relatively expensive for foreigners, at 1100 LKR ($8.50). Most accommodation in Kandy seemed pricey, so I was pleased to find Sevana City Hotel within walking distance of the train and bus stations for 2500 LKR ($19) per night. Although a little soulless, it was excellent value — clean, with hot water and working air-conditioning. The wi-fi was terrible, but I could put up with it for a couple of nights. While Kandy didn’t do much for me, the train ride there from Ella was a big highlight of the trip. It took around seven hours and cost 230 LKR ($1.75) for a second class ticket. Given the incredible scenery along the way, the ticket is worth far more. 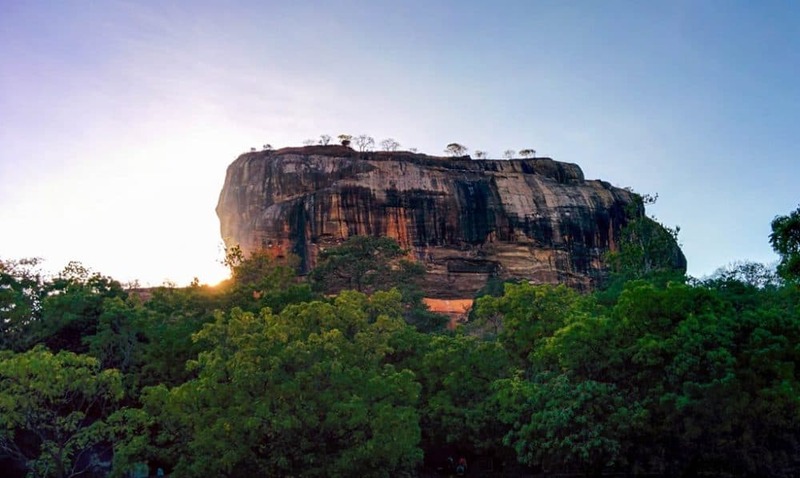 The mountain fortress at Sigiriya is arguably Sri Lanka’s most well-known attraction, and I couldn’t leave the country without having climbed it. While it’s possible to visit on a day trip from nearby towns and cities, I chose to stay in Sigiriya village. That turned out to be a good choice, making it much easier to be at the ticket office at the 7am opening time to avoid almost all the other visitors. I’d very highly recommend doing the same – I actually ended up at the summit of Sigiriya Rock entirely alone for 20 minutes, a magical experience as I gazed out over the surrounding landscape. The longer I spent there, the more people showed up. By the time I headed back down late morning, I was passing large tour groups the whole way. Despite the ridiculously high cost for foreigners (3300 LKR, or $30 USD), it’s worth making the trip to Sigiriya. Give yourself at least half a day, so you can explore the side trails and small museum as well. Note that hornets can be a problem on the final climb to the summit. They nest in cracks in the rock, and you’re very exposed as you climb the metal staircase beside them. While a shelter and protective clothing are provided if you need them, I’d suggest taking a jacket and long pants with you as well. I had to delay starting my descent for half an hour due to hornet activity, but didn’t get stung. 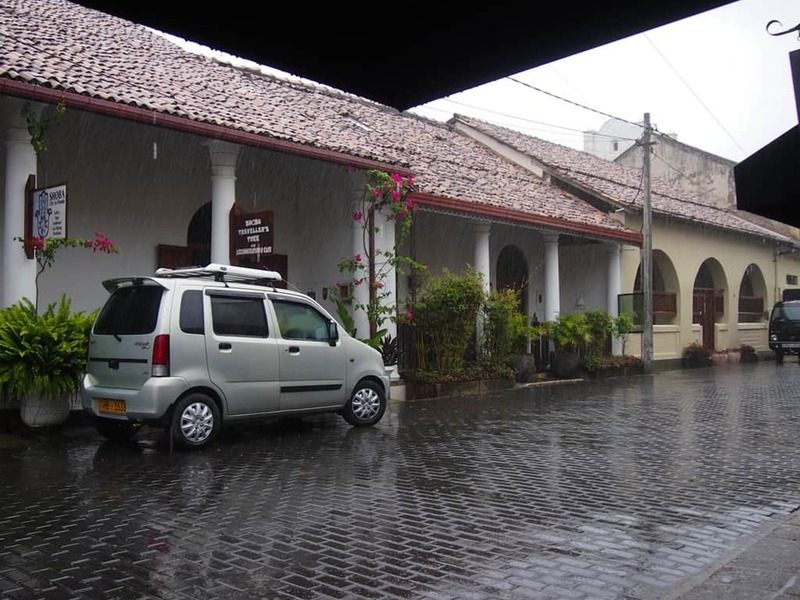 I booked two nights at Palitha Home Stay, and loved it. The family was great, the food was wonderful (including an impromptu kottu roti cooking lesson one night) and although there were a few bugs due to the location, the fan room was clean and tidy. Monkeys played in the trees nearby, and apparently wild elephants roam along the street at night. You’re advised not to wander round after dark as a result. In the end, I decided to stay an extra two nights rather than move to nearby Dambulla. That felt like the right choice – it was much more peaceful in Sigiriya! I took a long and bumpy bus ride from Kandy to Dambulla for 200 LKR ($1.50), then swapped to a local bus for the last half hour to Sigiriya. 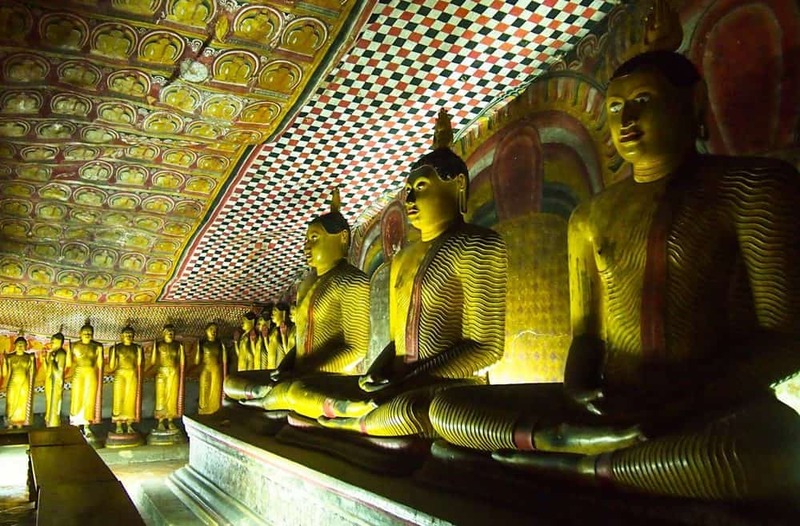 I ended up just taking a day trip into Dambulla to visit the cave temples and Golden Buddha, which were more impressive than expected despite the crowds. Were they worth the 1500 LKR ($11.50) entry fee? That’s debatable. If you’re in the area anyway, though, they’re probably worth the money and sweaty 10-15 minute climb from the entrance. Don’t forget to pay for a ticket as you enter the complex. You can’t pay at the top where the caves are, and won’t appreciate the climb back down and up again to do so. My homestay family in Sigiriya was heading into Dambulla anyway, and offered me a ride. Do you have any other questions about budget travel in Sri Lanka? Leave them in the comments! Yeah, I’ve definitely heard differing reports about travel as a solo female. I guess a lot of it comes down to personal comfort levels with the amount of attention you’re getting. Even as a guy, I got curious stares fairly often! I’ve just seen your post, I’m hoping to do the same as you, backpack on my own in Sri Lanka but was a bit wary of the whole men staring thing as well as getting around on the buses that don’t seem very regular. I only have a week so am wondering if to do it on my own or book an overpriced tour that my agent is trying to get me to buy..
WOW is this thorough!! I am with Lauren in regards to being a solo female in Sri Lanka. I was only in the country for a week, and I was with a group. But, the few times I was alone, I felt very uncomfortable by the unwanted attention from the men, particularly in Colombo and particularly from the tuk tuk drivers. I never felt threatened though. The country and the people are quite lovely! Unlike you, I did get a bit exhausted from the rice and curries and on the last day, when we were at a mall in the capital, I found a pizza place. I was SO EXCITED for the pizza but when I bit into it, the sauce was ketchup. I don’t think I have ever been so bummed about food before. Great job, Dave!! Pretty thorough job Dave. Photos are great! Yes the article is long but very informative. I especially enjoyed Lauren’s input on solo female travel. Thanks! I would have liked to get to the eastern beaches for some diving, and up north to see a different (Tamil) side of Sri Lanka, but was happy to save that for the next trip. The wildlife safaris were also somewhat appealing, but having spent a bit of time in Africa, they weren’t a high priority given the cost. Three weeks felt like a minimum, although I do travel slowly due to trying to work at the same time. You could probably rush through the areas I covered in two weeks if you really wanted to, but if you prefer a more sedate pace or want to cover a larger area than I did, I’d suggest 3-4 weeks is good. Looks like Sri Lanka is in the sweet spot for being developed enough to make for a great trip, but still not fully discovered by the forces of mass tourism … I need to go as soon as I can, great post! 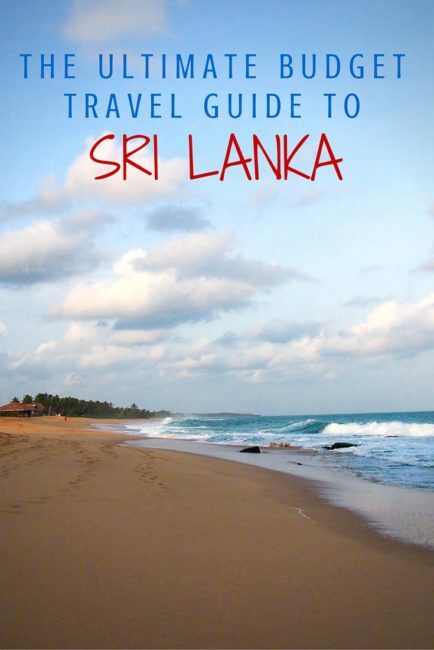 What a through guide to Sri Lanka … this country will top my list for 2015! Many thanks for this excellent informative article. I will be heading to Sri Lanka travelling on my own Mid- March 2015 for a few weeks. I don`t fancy hiring a driver for financial reasons so it`s great to know it`s possible through public transport. Did you take your solo trip to Sri Lanka? How did you enjoy your time? We’re you uncomfortable as a so,o female traveler? Thank you! Hi! I came across your blog on google and I’m so glad I did! I have taken lots of notes from your notes. A friend and I are backpacking for three weeks in Sri Lanka in July and have noooooo idea where to start with organising things!! Your blog has helped a lot. Do you think it’s ok to book accommodation along the way? Or do you recommend pre booking everything? I’m really interested in home stays and guest houses. Hi Colina, thanks so much! In terms of accommodation, I did a bit of both when I was there in August, and both were equally successful really. I’d recommend having something lined up for at least your first night, especially if you’re coming off a longhaul flight. After that, you can either book online the day before once you know where you’re likely to go, or in most cases, just rock up and find something. It’ll likely be a little cheaper if you just turn up, as you can negotiate the rate. FWIW, I prebooked in Mirissa, Galle (the first time), Kandy, Sigiriya and Negombo, and just turned up in Galle (the second time), Tangalle and Ella. more that the reading, I enjoyed looking at the pictures frankly. So scenic and mesmerizing.!! Complete Serendipity. Hi I was really pleased to find your site at 6am whilst I sit in bed reading in our rooms in Nuwara Eliya this morning. We have spent 8 days backpacking in SL so far & have another 3 weeks. We were starting to lose hope as our experiences seem a bit of a struggle so far. Your recommendations come at the right time. As a blonde, one suggestion I would add to solo female traveller article, is do not sit in aisle seats on public buses! I would echo everything else in Lauren`s article. We are really struggling with getting transport information. As budget travellers it just doesnt seem to exist! Our next journey is to get from Ella- Udawalwe- coast. I just hope we can get some info in Ella. Any tips? 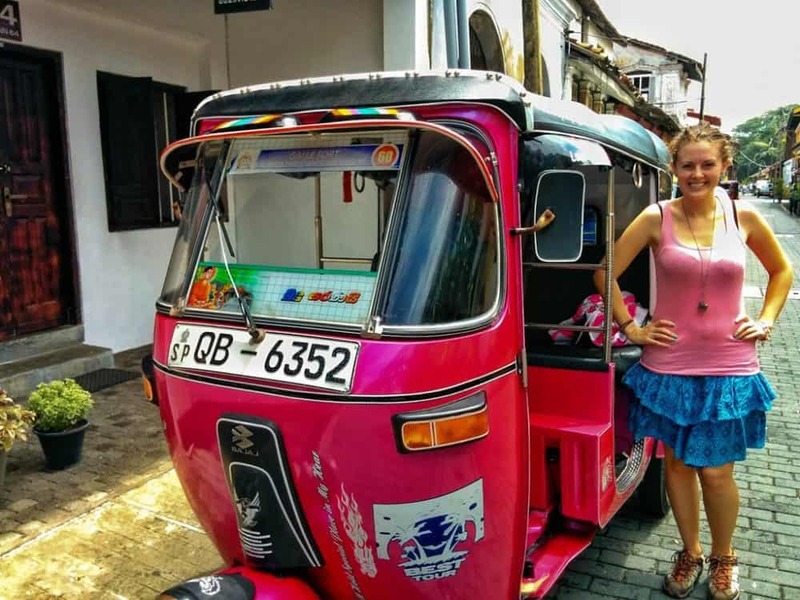 Yeah, backpacking in Sri Lanka was a bit of a challenge at times — overall I definitely loved my time there, but then again, I’m not female and can imagine that there is an extra degree of hassle involved every day for you! In terms of information, you’re right — unless you happen to find someone’s blog post, there’s almost nothing online in the way of transport information for buses (you can usually find a train timetable somewhere). In the end I just gave up trying to get assurances about anything to do with buses ahead of time, and asked my guesthouse owners what the real story was. They always knew! I think unless you’re really getting off the beaten track, you’ll be able to get to anywhere by some combination of bus and taxi/tuktuk. It just won’t always be particularly direct or fast. 🙂 I don’t have any information about the Ella – Udawalwe – coast route you’re looking at, and there’ll almost certainly be a change of bus involved somewhere — again, someone in Ella will definitely know. Hope your trip improves! Excellent article. You have come really handy & at the right time, since I am going to Sri Lanka on solo travel from 10th June 2015 for 7 days. So, glad to have found you. Anyway, I wish to know if there are any good gyms there in Galle, Kandy and Colombo ? I know gyms would be the last thing tourists would want to see. But still ! I am fond of physical fitness and would want to spend couple of hours each day working out. Please respond. Sorry, I wouldn’t have a clue about gyms in any of these cities — they weren’t something I was looking out for. You might be best to find Sri Lanka expat groups on Facebook and ask your question there, I think. Okay, in any case I appreciate your quick response. Thanks a ton ! Hi, Dave. I’m so happy I came across this post. I’m going to Sri Lanka on the 20th! Your detailed report is definitely going to help me. I’m so glad it includes accommodations. Like you, I’m seeing now that the prices are kind of high. My first stop, btw, will be Negombo. I’m going to need a couple nights to recover after my flights. 🙂 At some point, I hope to go north and east–in addition to the southwest. A lot will depend on the weather. Enjoyed reading that you seemed to have covered everything! I have read on the comments here that Sri Lanka can be a difficult place to travel. Me and my gf are starting a six month trip of SE Asia in Sri Lanka but have not really backpacked anywhere before. Do you think this will be a major problem. Also would you suggest staying in Negombo or Columbo for the first few nights after we land? I didn’t stay in Colombo at all, which in hindsight may have been an oversight. 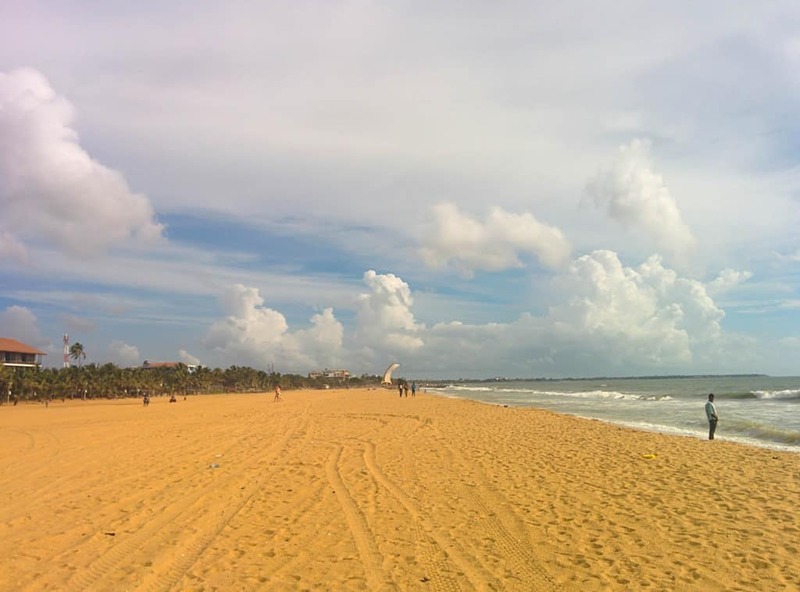 If you want a bit of beach time for the first few days, Negombo is fine — but it felt very touristy to me compared to other places I went. The food was generally watered down and overpriced as well. If you want to throw yourself into the thick of things straight away, head to Colombo! Thanks for sharing your wealth of information about your travels to Sri Lanka and Asia. This is the best site I’ve come across whilst I’m planning for my backpack adventure in 2016. Best wishes for your walk in Spain too. 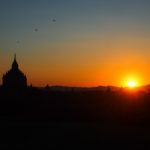 I,ve walked the Spanish and Portuguese Camino and definitely hooked on epic walks. Planning to walk the via francigena next year ….check it out if you get the walking bug. Honestly, they’re both fantastic. Vietnam will be cheaper, the food is equally wonderful (although quite different) in both countries, and there’s so much to see and do in a three week stint that you definitely won’t get bored. You really can’t go wrong with either option, so go wherever appeals the most! i just went through your article, i have to say I’m shocked ! you paid what for accommodation? i mean, i did the very similar trip in lets be fair , backpacking conditions, commuting by local transport eating local food, staying in homestays and guest houses. I have never paid more than 900lkr for double room in above locations . my daily budget for two people including 2 r&c and a beer local snacs and acco was somewhat 1500-1700LKR per day FOR TWO people. based on article like yours many backpackers will be surely put off, please don’t share this under backpacking theme, its far away from backpacking . to my taste of course. Thank god you stopped by to tell me how to be a real backpacker, Joe. I would have been lost without you. Are you saying you paid about €10 per day on food and accom , total for two people? as id like to think we are great at barganing etc, but this blog is quit off putting for sri lanka, which im planning to head to for two months in november. Hi- I never post on blogs, but just had to sayTHANKS! I am planning a trip next month and this helped me so much! I have bookmarked your site! I’ve no idea, I’m afraid — I didn’t track my expenses in that level of detail. Small luggage is definitely better on buses, as there often isn’t much room. On trains, you’ll have less of a problem with a medium sized suitcase, but remember that if you need to walk with it anywhere, temperatures are hot and pavements often aren’t very smooth, so a light backpack will be easier. I travelled from Galle to Mirissa to Tangalle, spending a few days in each, and then took the bus up to Ella. 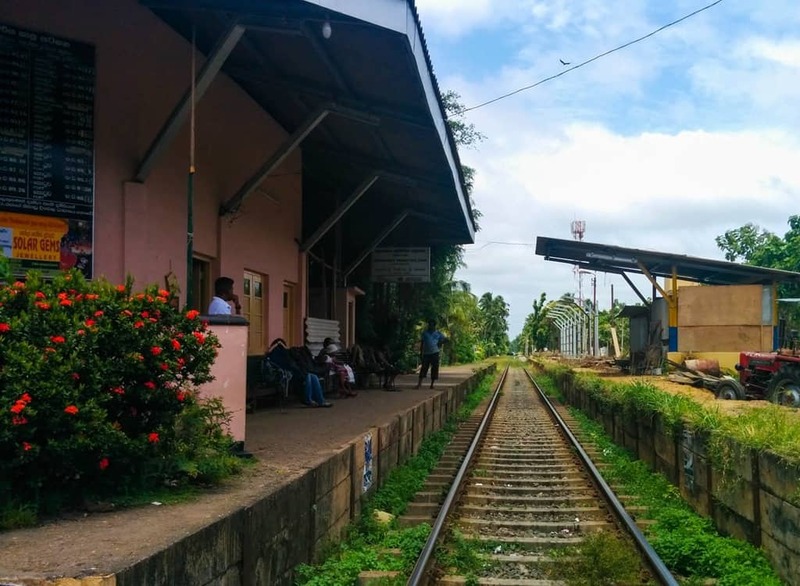 There’s no train that goes from the south coast to Ella or vice versa, so you’ll either need to backtrack to Colombo and take the train down to Galle, take buses like I did, or hire a car and driver. I’m not familiar with Bentota, sorry. I will try to travel better with a bagpack specially for moving alone makes me feel easier to move around. I will go from Colombo to Kandy by train and i was thinking a next train to Ella. But i havent heard good reviews about buses and going from Ella to like Galle seems that only a bus works. I will try to hire a driver. That sounds good. Thank you for answering. Helps a lot!! If you’re short on time and/or don’t want to take the bus, then the car/driver option will be quicker and more comfortable (although quite a bit more expensive, obviously). This was great, thanks so much! I’ve done a ton of research on Sri Lanka already (mainly as a way of procrastinating from my studies) as I’m going there in August for 16 days – but your writing included a lot of things I didn’t know! I also really appreciated the note of being a female alone in Sri Lanka: I’m planning to do that in two areas: Ella and the “Cultural Triangle” (Polonnaruwa, Dambulla and Sirigiya) and while I don’t think I will like the stares and the attention, I am happy to hear that it’s more of a discomfort and not physical assaults. Of course, keeping in mind not traveling at night and staying aware of personal space and items. I also find it really interesting that you didn’t see a quality difference from paying $10-15 per night, to $40 etc. a night. That’s really good since my budget definitely calls for $15 a night haha! It was a helpful and great article over there. I am travelling to SL on 17/7/2016 for 14 days alone as a backpacker. I will be on budget. Hence, would stay in guest hotel, using public transport and eat street food. I would like to go on Ramayana based tour with Singiriya and Unawantuna as add on. Since this is first time I will be in SL and first backpacking tour ever , hence do you have any advice or suggestion ? I don’t really have any advice on budget travel in Sri Lanka beyond what’s offered in this article — I put down everything I could think of in the post. Sorry! How did ur Lanka trip go ? Question: best way to get to Polonnaruwa from Negombo? How about polonnaruwa to Kandy? I don’t think there is a train between them, so a bus? Then from Kandy I need to get to Hikkaduwa/Galle, how do I get there? Negombo to Polonnaruwa — there’s a train from Colombo Fort station to Polonnaruwa. It runs twice a day, but unless you want to arrive at 1.30am, you’ll want to catch the early morning train. You’ll be looking at a very early taxi ride from Negomobo to do that, or better idea, stay in Colombo the night before. See this site for timetables etc. Polonnaruwa to Kandy — there’s no train on that route. I’m not sure exactly which way the buses go, but there may well be a somewhat-direct bus. If not, make your way to Dambulla and do the reverse of the trip I did. 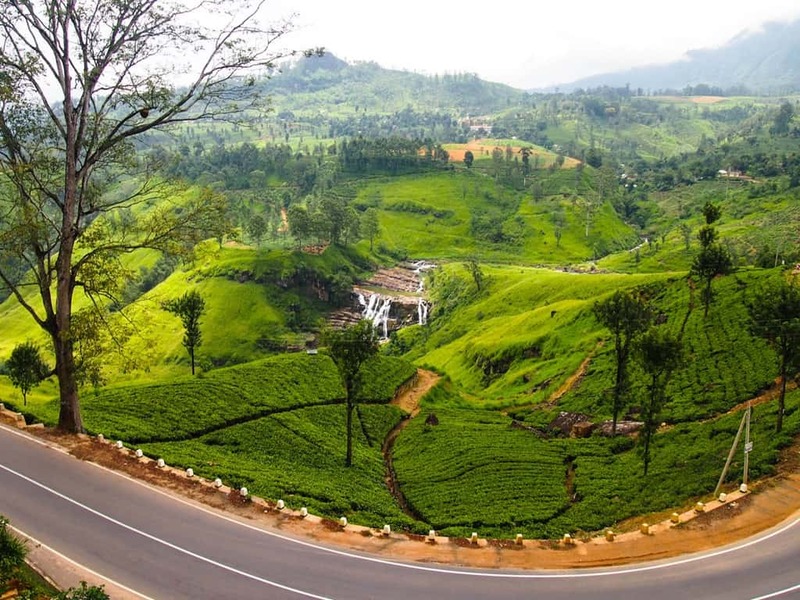 Kandy to Galle — you’ll be going via Colombo regardless of whether you take a bus or train. There’s apparently one direct train per day that leaves early in the morning from Kandy — it still goes via Colombo, but you don’t need to change trains. If you don’t want to get up early, check out the bus options, or expect to change trains in Colombo. This is a brilliant story! Helped me out a great deal with regards to approximate pricing etc. And the to and from place to place. Will definitely be looking into the option of motorbike or tuk tuk rental 🙂 happy travels! I have noticed this comment by many tourists to Sri Lanka, whether they are female or male. There are two main reasons i see for this. The first one is curiosity they have toward a foreigner especially a white in complexion. And the other well known reason to me is looking for an opportunity to make few rupees. Most of the locals think fair complexion of a foreigner is a sign of spending money lavishly even for picking a friendly conversation with them. I understand many male sri lankans try their fortune on this. When you mention men are staring, our culture shows men are breadwinners of the family & this could be a reason the starer’s are usually men. And thirdly i would say every society has its own production of bad apples. Hi Dave, there is finally an islandwide taxi sharing resource at srilankataxishare.com, its done by the Arugam Bay Traveller and seems to be working nicely. First of all thank Dave for visiting my country and left this kind of long and detailed information for people who willing to come in future..And Becky thank you too for my vising my country. I think I have to mention something about the solo trip for female. Actually as u and some other people mentioned that staring at you is normal here. not only for female but also for men if you are not brown skinned. Actually I’m sorry if you felt uncomfortable and awkward by people staring at you. I can guaranteed there will be no harm for a lonely lady in Sri Lanka. But you will get some extra care and safe people will always happy to help and giving hand when u want for no money.The reason behind people staring at you is simple ,its the colour of your skin. more than 95 %Sri Lankan have brown skin. we see white skin/black skin just from TV, Internet or tourists. So it not because you are female. . they not look at you as perverts 😛 😛 😛 hahaha..Actually unlike our neighbor countries Sri lanka is very safe country to female travelers. there will be no harm or haressments for you people in sode my country ..So please don’t be afraid come here for a solo tour when someone stare at you for no reason just give them a warm smile.they will smile back nad you will feel comfortable .you will be safe an u can have the best of your tour..trust me..
My sister and I are planning 2 weeks in Sri lanka .. I definitely looking to do South western and central Sri Lanka do you think we will have time? Colombo- Kandy- Ella- Arugam Bay- Yala- Marissa – Colombo? I am interested in hiking/ beaches and seeing the wildlife. You’ll probably feel a bit rushed, but it’s manageable. Hi Dave, thanks for the really comprehensive review! My brother and I are heading over to Sri Lanka for the first time this Christmas, and hope to bump into other backpackers who will be there at the same time. Since it’s just a ten day trip for us, we are thinking of concentrating on Unawatuna and Marissa, but Trincomalee, Dambula and Pidurangala rock are also incredibly tempting!! Just putting out itinerary together now, so if you have tips that would be amazing! nxt month am traveling to srilanka .thnx for the valuable info. Thank you for your positive comments about my country.I know this is an old article but i saw it today and I really wanted to say thank you. I will like to give some advises for the travelers who are planing to visit sri lanka. If you are planing to travel by train without pre booking try to avoid office trains(around 7 am to 8 am and 5 p.m to 7 p.m).It will be it will be crowded. And if you are traveling in Fridays or in a long weekend I will recommend you the pre bookings. Always be tricky when you dealing with tuk tuk drivers. Definitely there are so many good and helpful tuk tuk drivers but there are some cunning drivers also.Try to use meter taxis and always ask from someone about taxi fees before asking it from the tuk tuk drivers. About staring;I’m really sorry for it,it’s because of curiosity and I’m sure they are not going to harm you. Try visit different parts in Sri Lanka you will get lots of different experiences in this small country. It’s in the post – Lonely Beach Resort. Wifi was excellent! Hey thank you for this post, still very very useful a couple years on. Planning a solo trip for 3 weeks in June. Nervous about travelling between destination’s as a solo female. Also hoping there will be a chance to meet other solo travellers?? I agree with the many posts above, this is a great source of information on Sri Lanka. My partner and I are hoping to spend 2 months there starting next January 2018. We almost canceled it after looking at the cost of accommodations, especially in the beach areas. It looked impossible on our usual budget of $25-$35 US-Dollars. The problem being that we live in a cool climate here in Northern California and hot humid places without air-con are difficult for us even with the ocean breezes, which in my experience in SE Asia and India beach ares are sporadic at best. We are continuing to look into it after reading your post even though the beach areas still look out of our budget. Even without air-con those you listed are notably higher for Jan-Feb than you posted probably due to the fact you were visiting that area off season. We are still on the fence about spending 60 days there, but at least your excellent blog got us reconsidering. Thanks! Nice article Dave. Keep up the good work. Solo female. 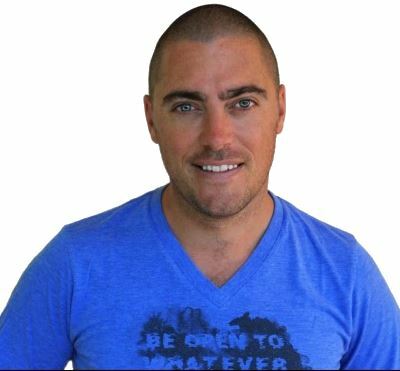 I travelled alone in Sri Lanka for 5months and never had any inappropriate attention. If your companion was wearing the tight tank and flouncy short skirt as in the photo that was why. Too much skin on show. Wear modest clothing or even just drap a shawl and you will be fine. Also possible to get a bus from Tangalle to Haputale/Ella in a day with just a couple of easy changes. Nope, that photo was an anomaly (it was laundry day) — other than at the beach, the rest of the time her legs and arms were fully covered, in non-revealing/non-tight clothing. I mentioned in the article and again in the comments that I was able to get a direct bus from Tangalle to Ella, but yes, it’s also possible to do it with changes if you miss the direct one. Staring men → It is same like summer in Europe like men much attention on beauty of the women..More attention mean you are so awesome, lovely, like to talk with you !! This doesn’t mean any sexual harrasments but you are too awesome for others…And country like Sri Lanka they like to talk with strangers ‘ The 1st thing ask, Hello, which country you are from’..Means they like to know about your country..Sometimes your self…And they might like to ask contact numbers for making freindship… That’s all…!! Thanks for this post. Really informative. I am from India & planning for 6-7 day tour with my wife to Colombo, Kandy, Galle & Bentota. Planning a trio to Sri Lanka soon, this is very helpful!